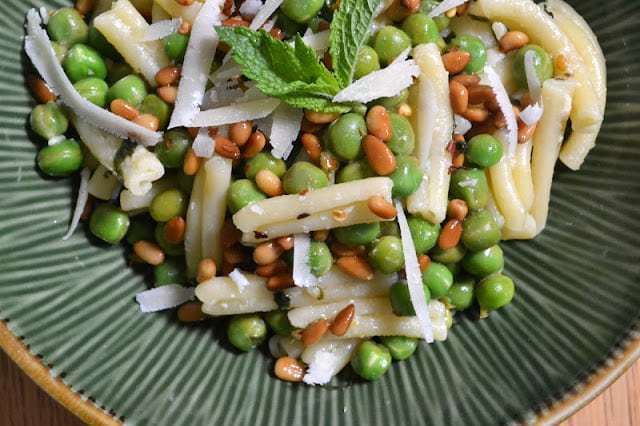 Pasta with Fresh Peas Lemon and Mint ~ a fresh and easy 30 minute meal that's definitely not the same old pasta night ~ the family's going to love this! Cook your pasta in lots of salted boiling water. Time it for a few minutes less than the package directions for true al dente. For the last minute of cooking, put the peas into the pot and bring the water back to a boil. Drain and set aside. Heat the olive oil in a large pan and saute the garlic and red pepper flakes for a few minutes, don’t let the garlic brown. Add wine and lemon juice to the pan and let the liquid cook down for a few minutes. Add the lemon zest and fresh mint. Season to taste with the salt and pepper. Heat through. Add the cooked pasta and peas directly into the pan and toss to combine everything well. Toss with the grated cheese and taste for seasoning. Serve with more grated Parmesan Reggiano cheese, fresh black pepper and the toasted pine nuts.